Requirements to properties of protective-technological coatings for the tin bronze melting from secondary raw materials were formulated in the work. The choice of model glasses compositions in the initial Na2O-B2O3-SiO2 system on the basis of the melting parameters values was made. Non-scarce and inexpensive raw materials for protective coatings were selected. Also the best glass composition was determined based on the complex of chosen properties. 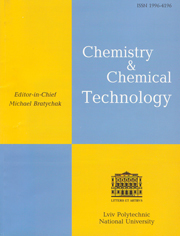 The formation mechanism of the selected composition glassy melting by using DTА and XRDА was studied. Pikunov M.: Plavka Metallov. Kristallizatsiya Splavov. Zatverdevanie Otlivok. MISIS, Moskwa 1997. Popov V., Smolyakov V., Gorshkova V. et al. : Inf. Bull. Lityo Ukrainy, 2011, 10, 134. Kurdyumov А., Pikunov М., Chursin V. et al. : Proizvodstvo Otlivok iz Splavov Tsetnykh Metallov. MISIS, Moskwa 1996. Davis J.: ASM Specialty Handbook: Copper and Copper Alloys. ASM International, Ohio 2001. Chastain S.: Metal Casting: a Sand Casting Manual for the Small Foundry, v. II. Chastain publishing, Florida 2004. Braginа L., Sobol Yu., Sobol N. et al. : Vestn. Nats. Techn. Univ. Kharkiv. Polytech. Inst., 2006, 12, 134. Bragina L. and Zubehin A. (Eds. ): Tekhnologiya Emali i Zashchitnykh Pokrytiy. NTU «KhPI», Kharkov 2003. Goleus V.: Inform. Vestnik Ukrainskoy Assotsiatsii Emalirovshchikov, 2008, 2, 20. Matveev М., Matveev G. and Frenkel B.: Raschety po Khimii i Tekhnologii Stekla. Stroyizdat, Moskwa 1972. Pagliuca S. and Faust W.: Porcelain (Vitreous) Enamel. Tipografia Commerciale srl, Mantova 2011. Bragina L.: Proceed. 20th Int. Enamellers’ Congress, Turkey, Istanbul 2005, 23. Poruchikov Yu., Mysik R. and Titova A.: Razlivka Medi i Mednyh Splavov pod Zhidkimi Shlakami. TsNIItsvetmet, Moskwa 1981. Appen A.: Khimiya Stekla. Khimiya, Leningrad 1974.